I took a couple days to get through Honduras, which certainly doesn't do this jaw-dropping-incredible-scenery country justice. 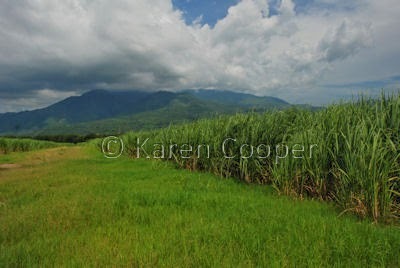 There are uncountable miles of sugar cane fields set amid a backdrop of rolling hills and thunderstorms. Something out of "The Earth is Being Born" movie making material. Hurricane Felix went through part of Honduras, wrecking havoc and lives. Life just seems so ironic and unjust sometimes. The areas effected are the hardest to reach in terms of aid and support. I waited out Hurricane Felix in Guatemala. I am chicken of submitting myself to Mother Natures snarky moods on the world. I like peace and calm and blue skies. But to know and understand what makes life good, we need to experience the bad. Maybe not first hand anymore. I think I may be getting too old for the Hurricane Parties. On to more serene adventures! What a great place to take a stroll! I went to Honduras, Guatemala and El Salvador in the summer of 2006 and I had a fantastic time. I'll be back definetly. Nice one.